Built-in smart assistant that automates comfort and energy savings. Access climate controls from anywhere with the 4.5-star Vivint Smart Home app. Just ask Alexa to adjust the temperature for hands-free control. Get mobile notifications when Element self-adjusts. Designed to blend with your home interior. Tracks humidity levels to help optimize indoor air quality. Works with common heating & cooling systems, including conventional forced air, radiant, and heat pump. Up to 3 stages of heating. Up to 2 stages of cooling. Supports a wide range of fuels including natural gas, propane, electric, fuel oil, and geo-thermal. Built in fan timer. 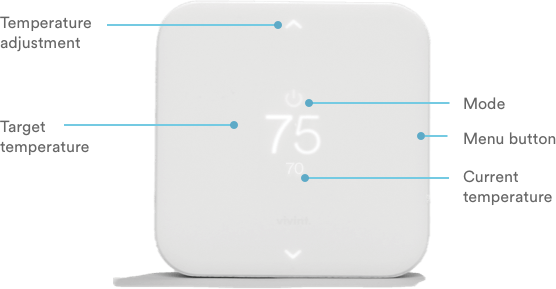 Vivint Element Thermostat fits seamlessly into your Vivint Smart Home system. Wireless thermostat controls let you start the air conditioning on your way home, or keep your home office toasty during a blizzard—all from the same mobile app that controls your locks, cameras, and garage door. Keep your home temperature exactly where you want it with Smart Assistant. Using geolocation, in-home sensors, and information about your local climate and household, Smart Assistant auto-adjusts Element to your preferences when you're home—and conserves energy when you're not, even if you forget to adjust it. Google Home works hand-in-hand with Element, letting you adjust temperature settings with only your voice. Turn on the heater without interrupting your kids' bedtime story, or cool down the kitchen during dinner prep—not to mention everything else the Google Home can do with your simple voice commands. Set custom notifications for Element to know the second your home’s temperature changes. Receive a mobile alert if the housesitter cranks up the heater while you’re away for the holidays, or a reminder that the air conditioner turned on in time for your mid-summer family reunion. 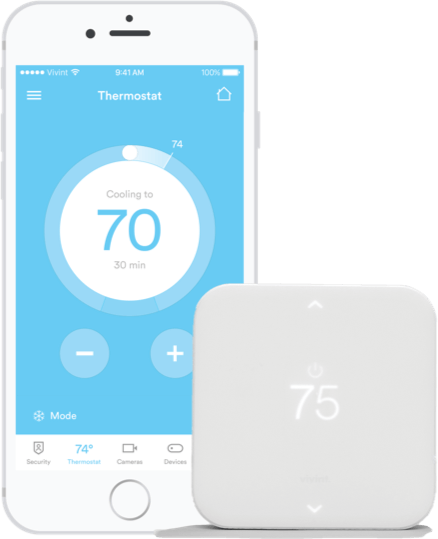 Along with controlling temperature, Element also measures humidity to provide even more control than the average wireless thermostat. Lower your home’s humidity without making it too cold, and ensure that any humidifiers or dehumidifiers are getting your home’s climate right where you want it, year-round. No more boring LED control panels that look like props from a 1960s B-movie. Element features a sharp, stark design that blends right into your home’s interior décor. The easy-to-read display illuminates on approach to show you current and target temperatures at a glance. Smart Home Pros will integrate your Element wireless thermostat with your smart home system to ensure hassle-free performance. Let Element handle the temperature.